Religious mystic, seer, icon, and in death an “incorruptible” – the enigmatic St. Bernadette grew from an obscure, impoverished peasant girl into one of the best known and beloved “living saints” of all time. Her visions of the Blessed Virgin Mary in a lowly grotto in a backwoods part of France made her a reluctant celebrity. After her coerced removal to a convent her renown made her the target of an insanely jealous Mother Superior whose personal mission focused on humiliating and degrading the young novitiate, thus ensuring her years until her death at age 35 were not pleasant ones. Her beatification as a saint by the Catholic Church in the early 20th century led to the discovery that Bernadette’s body was “incorruptible”, meaning it was free of expected decay. This, too, was considered a sign of her saintly mien, and only enforced the Church’s position to canonize her as St. Bernadette in 1933. The village of Lourdes is a thriving tourist destination nestled in the foothills of the Pyrenees Mountains in the south of France. Today there are about 20,000 residents, and the town enjoys the influx of between 3 million and 5 million religious pilgrims and curiosity seekers annually. They all journey to this remote spot near the Spanish border in France to visit the shrine of The Grotto at Lourdes. This is the natural cave where, in 1858, a young peasant girl named Bernadette Soubirous was allegedly visited on multiple occasions by the Blessed Virgin Mary. This site, now a modern tourist attraction, boasts a natural spring (uncovered by the hands of Bernadette herself), and its waters allegedly have the power to heal the infirmed. Tastefully decorated with benches, religious iconography and statuary, the meticulously maintained Grotto at Lourdes is a far cry from its condition when Bernadette Soubirous first made her contact with the mother of Jesus. In Bernadette’s day this revered, hallowed shrine, once known as “the Grotte de Massabielle”, was the city dump. Bernadette was the daughter of a miller, François Soubirous, and Louise (née Castérot) (1825–1866), a laundress. She was born January 7, 1844, and she was baptized in the local parish church, St Peter’s, in Lourdes on January 9, 1845, the first anniversary of her parents’ wedding. She was christened Marie Bernadette, though she would be known as Bernadette for the rest of her life. She was the oldest of the five children who survived infancy [Her mother had birthed a total of nine children: Bernadette; Jean, born and died 1845; Toinette, 1846-1892; Jean-Marie, 1848–1851; Jean-Marie II, 1851-1919; Justin 1855–1865; Pierre, 1859-1931; Jean, born and died 1864; and a girl, Louise, who died soon after her birth in 1866]. Her godmother was Bernarde Castérot (Louise Soubirous’ sister); Bernarde was moderately well-off, a widow who owned a tavern. France was in dire financial straits at the time of Bernadette’s girlhood, and grinding poverty was everywhere. The Soubirous family lived at subsistence levels. The tragedy of high infant mortality rates was a painful reality to the Lourdes villagers, but so, too, were epidemics. Cholera swept through the region in the fall of 1845; the toddler Bernadette contracted the disease. She recovered, but for the rest of her life she would be sickly and frail, suffering from asthma as well. The French sense of jurisprudence at the time often meant prison terms for petty offenses all out of proportion to the “crime” (Victor Hugo based his protagonist on such a severely punished man – who stole a loaf of bread – in his classic, Les Misérables). Bernadette’s father, François, was convicted of stealing two bags of flour, and he was imprisoned. Apologists say he was “accused” unjustly – the reality is his family was starving, he was a miller, and he had access to food grains. He certainly stole the flour. Going to prison for a lengthy term, however, was unduly harsh. With François out of the family picture, Bernadette had to be of service to help keep the family going. She scrounged for scrap material. She worked where she could. Louise had her hands full with the younger children, and it fell to Bernadette to also be a care giver as needed. As a result, she could not attend school on a regular basis. Much would be made of this later – naysayers would question why the Virgin would appear to such a “stupid, illiterate” peasant such as Bernadette [Bernadette was not “stupid”. She learned to read and write well, and entries in her own hand from her private diaries are eloquent, well-structured introspections that are not the scribblings of a “stupid” person]. The Basques in Spain are an ethnic group that has proudly and determinedly tried to maintain its cultural integrity despite centuries-long attempts to wipe it from Spain’s face. Like the Basques, the peasants of Lourdes spoke a dialectical variant of French (linguistically known as Gascon Occitan). To the refined ear of “true” French speakers the Gascon dialect held a dissonance; Bernadette, as did few in Lourdes, did not understand “true” French. This language barrier would also lead to later accusations that she was mentally inferior [categorically and emphatically she was not of less than average intelligence]. The Catholic Church’s grandeur had a purpose. Churches, as places of worship, by intent were large-scale, ornate, architecturally pompous affairs. The reasoning was simple – in an era with little in the way of leisure or pleasurable activities church attendance for the average peasant was the equivalent of going to the theater today. The sensual nature of the experience was an essential part of town life – churches were literally the closest thing to sensory overload these people had in their lives. The sights, the artworks and statuary, the transcendent symbolism of the stained glass, the voices lifted on high in hymn, the smell of burning incense. These were all great fodder for the human spirit as well as for the nebulous “soul”. Bernadette and her family were devoutly religious, but perhaps no more so than the average Lourdes villager. Mass, vespers, and different callings to prayer were part of their daily lives; it was something, particularly for High Mass, to which they looked forward. These Masses were times of music and art and joy – Catholic Church attendance for these people was not the solemnity generally associated with going to Mass. The level of religiosity in the Soubirous household took an upward dramatic turn, however, on February 11, 1858, when Bernadette, her sister Toinette, and another friend decided to go visit the town dump. This little cave is about a mile outside Lourdes. Digging pit barrows was hard work – it was easier for the town folk to throw some of their unwanted detritus in this out-of-the-way grotto. This was a good picking spot for street waifs. Bernadette and her companions went out looking for firewood and bones (some of which might contain meat scraps and could flavor soups; others could be burned for fuel). What she found instead, at the city dump of Massabielle, was immortality. In the language of Bernadette’s people, “Aquero” means “that”, as in “that thing”. It is but a simple pronoun, and if one notes the spelling of the word one sees the Spanish linguistic influence on the people of the French Pyrenees. By this date, the Soubirous family’s financial and social status had spiraled downward. They were effectively homeless; a cousin of Louise Soubirous’, Andre Sajoux, let them live for free in a one-room basement. The family called it le cachot, “the dungeon”. Bernadette helped where she could; the dump might cough up something of use. She, her sister, and a friend found their way toward the Gave de Pau River (really a stream, but subject to dangerous flash flooding) near the grotto. While the other girls forded the little stream in front of the grotto, Bernadette lingered. She looked for a spot to cross where she wouldn’t get her stockings wet. She finally sat in the grotto to remove her shoes. She stripped off her first stocking when she heard the sound of rushing wind although nothing moved. A wild rose grew in a natural niche in the grotto – this rose swayed in the unfelt breeze. From the rose niche (more specifically, the dark alcove behind it) Bernadette saw a “dazzling light, and a white figure.” This was the first of eighteen visions of what she referred to, in her Gaston Occitan dialect, as “Aquero”. She later quaintly said the figure she saw was uo petito damizelo (“a little damsel”). She had no idea who this beautiful, smiling woman was. She was scared, but when she made the sign of the cross – at the same time as the woman – her fear vanished and she felt “a great peace inside”. Bernadette realized she was the only one of the trio who had seen this spectral presence (known as The Apparition of Lourdes in Church lore). She asked her sister and their friend if they had seen anything; they replied they had not, and this frightened her. Demon possession and belief in such things as witchcraft were common, and Bernadette was rightfully frightened of being branded as a heretic, a witch, or possessed. She asked her sister Toinette not to tell anyone what had happened. The younger girl, of course, could do no such thing – she promptly told their mother, Louise, of Bernadette’s claim. In a fit of parental even-handedness, both girls were beaten by Louise, and Bernadette specifically was forbidden by her mother from going back to the grotto. This narrative is perhaps the closest Bernadette (written as an adult) ever came to self-aggrandizing. Although her pride is very mild, she was not the heroine of this second event. It was another girl who threw the holy water and still another who threw a rock. Bernadette was in a religiously ecstatic state, almost catatonic according to the other girls present [later, more authoritative eyewitness accounts support her lapse into a trance]. She was in no condition to do anything more than what she ultimately did: collapse in a heap. Fearful still that Aquero was an evil manifestation Bernadette mulled over the mental image. The little damsel, according to Bernadette, was a “beautiful woman”, “always smiling”, “about the same height as me”. She wore a long white veil, a white dress with a blue girdle; she had a golden or yellow rose on each foot, and a rosary in her hand. Another reassuring sign was the apparition’s beautiful bare feet; the folklore said demonic apparitions (even while in human form) had cloven hooves or animal paws. [The description of the apparition fits popular renderings in Western Europe of the Virgin Mary: Caucasian, benevolent, beatific, etc. This would certainly be in Bernadette’s purview. She would have seen such imagery hundreds of times in her young life, and although this does not negate the idea that she saw something it does tend to lend itself to such visions as internal. It is expected she would “see” this rather than the true flesh-and-blood Mary: a swarthy Jewess with wavy dark hair. The yellow roses on Aquero’s feet is of particular interest – it is an odd bit of minutiae whose symbolic significance is unknown]. Although The Lady spoke in Gascon Occitan to Bernadette (whose French was very poor) Aquero used remarkably formal language in her request. “Would you have the goodness to come here for fifteen days?” The significance of this politeness was not lost on the gawkers (though they neither heard nor saw anything, just Bernadette’s report of what was said). It was highly untoward for anyone to use such formal address when speaking to a penniless, working-class peasant girl such as Bernadette. The paper, pen, and inkpot were returned, unused, to the townspeople who had supplied them. 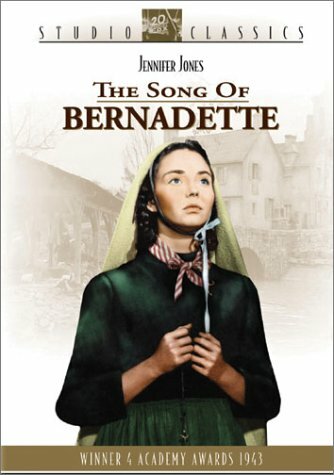 Bernadette’s story caused a sensation in the village. The citizenry was divided in its opinions. Some thought she was mentally ill and suggested she be put in an asylum. She soon had a large number of people trailing her on her daily trek to the grotto, however, both skeptics and believers. Most followed out of simple curiosity; others firmly believed they were on the cusp of witnessing a miracle. For her fifth appearance on February 20, thirty people were present. Bernadette said later that The Lady taught her a special prayer (one which she said every day of her life, but never wrote down or repeated to anyone). By then, news had spread to neighboring towns; many people jumped to the conclusion that Bernadette’s “lady” was the Virgin Mary. Bernadette, however, made no independent efforts to corroborate or otherwise establish the phantom’s identity, and she contented herself with the simple acceptance of the being’s existence. Bernadette’s sixth trip to the grotto saw her as a sort of juvenile Pied Piper, leading over 100 people in procession to the grotto. She did not ask them to come; they did this freely. The public disturbance was enough to bring her to the attention of the local police commissioner. He called her into his office and threatened to arrest her. There was no evidence of fraud or other wrongdoing; there was little civil authorities could do to her. She remained stubbornly calm and consistent during her interrogations. Her story was invariant, and she never claimed any knowledge beyond what she said the vision told her. Her father, François Soubirous (out of prison), hiked down to the commissioner’s office and assured the official he would put a stop to Bernadette’s activities. Bernadette was back at the grotto, her seventh visit, on February 23. There were roughly 150 spectators this time, among whom was a tax inspector, a court official, and officers from a nearby garrison. Bernadette came away saying Aquero had told her a secret, which was for her alone. She never revealed it to anyone. The number of onlookers grew with each meeting, and on February 24 Bernadette enjoyed the presence of 250 onlookers for her consultation with Aquero. She relayed Aquero’s surprisingly generic and less than earth-shattering message: “Penance! Penance! Penance! Pray to God for sinners. Kiss the ground as an act of penance for sinners!” Those present said Bernadette kissed the muddy, tainted ground of the town dump. Bernadette’s relatively benign description leaves out the onlooker’s horror as she engaged in what could only be described as feral behavior. Since the gathered crowd did not “hear” Aquero’s directive, what they saw and reported was a bit more outlandish than Bernadette’s merely scraping around for a drink of muddy water. It is the very horrific details of the behavior that leads one to conclude the eyewitness accounts are perhaps the truth in this case. Eyewitnesses reported that Bernadette, in a trance, chewed and ate grass she plucked from the ground. She smeared mud all over her face, and she actually swallowed some of this tainted muck. Some onlookers shouted allegations of fraud and that Bernadette was obviously insane. Her eating the mud disgusted many and embarrassed others who believed in her visions. Relatives wiped her face clean with a handkerchief. She explained Aquero had told her “to drink of the water of the spring, to wash in it, and to eat the herb that grew there,” as an act of penance. There was no spring in the grotto at Lourdes then. Bernadette’s grubbing in the damp ground at a particular spot (as she truthfully reported) brought a puddle of muddy liquid to the surface. Also, it did begin to run clearly as she also truthfully reported. Today this spring runs pure. Believers say this is a miracle. Skeptics will point out she did nothing more than release a subsurface aquifer. Both are partly correct. There is evidence in the geology of the area to support the idea of a fresh water spring’s flowing freely at some time in the past but it stopped (or was plugged up thanks to the debris accumulation over the years in the grotto). In any case, this was before Bernadette’s time, and she certainly would not have known of it. For her to scrape in the proper spot may be nothing more than coincidental, but it can be called wondrous, even if it is not a divinely inspired miracle. She most assuredly put her health at great risk by drinking from this source’s first offerings – the bacteria and toxins alone might have killed her. That, too, perhaps could be thought of as miraculous – others might call it foolhardy, but lucky.] Bernadette, because of her outrageous behavior, was again questioned by police and set free. The spring reportedly began to flow consistently and clearly the next day. On February 27 and on Feb 28, she made her routine visits. Barring the swelling crowds (first 800 people, then 1000 present on February 28) these visitations were unremarkable. A local judge, however, felt compelled to question her in the wake of her tenth visitation of February 27. The first allegation of a healing miracle occurred on her twelfth visit to the grotto (March 1, 1858). Bernadette was in “conversation” with The Lady. Among the 1500 spectators was a pregnant, local housewife named Catherine Latapie. She was nine months along, and she also had a paralysis of the ulnar nerve in one arm (following an accident). Latapie said she regained full movement of her affected limb after bathing it in the Massabielle spring. Simultaneously, though, she went into labor and had to leave almost immediately to give birth. She told her story to physician Dr. Pierre Romaine Dozous after the fact (she did not report it to the crowd as it happened). Some devout people followed Bernadette’s example from her ninth visitation, and drank and washed in the water. Dr. Dozous started collecting anecdotes about “healings” at the spring. Latapie’s was the first such healing claim (of course, it is completely unsubstantiated and unverifiable). Noteworthy at this juncture is that the girl Bernadette never mentioned to anyone even the remote possibility of the Lourdes spring water containing special healing powers or other healthful properties. She only drank from it the one time because she was compelled to. The mythos of the healing waters of Lourdes is a construct not of Bernadette’s making. Her visits with The Lady were generally spent in silent prayer and contemplation. For a 14-year-old girl this is quite a mature achievement. It was her onlookers who created the sensationalism associated with the site, not her. Visits to the grotto, and the resultant messages from The Lady, became more direct. For her thirteenth round on March 2, Aquero told Bernadette, “Go, tell the priests to come here in procession and to build a chapel here.” Bernadette complied. Along with her two aunts she asked Father Peyramale (the local Curé) to do The Lady’s bidding. Peyramale knew, of course, of the grotto visions – he called Bernadette a liar, and he (with no authority) forbade her to go to the grotto. Bernadette was determined to make a believer of the priest, however, so she came back again with one of the Father’s friends. She was thoroughly questioned before the parish clergy and dismissed. Since the parish priests could not agree about what, if anything, should be done about Bernadette’s visions, the solution was left to Father Peyramale. He thought the best advice was to consult his bishop. The priest was given no clear direction except that his bishop warned him to stay away from the grotto. This would keep the clergy clear of a potentially embarrassing situation. The bishop, however, seemed not to care about what Bernadette did. This statement sent shock waves through both the town and the country. Bernadette had never claimed Aquero was anything more than an apparition. Townspeople surmised it was the Virgin Mary but this was never explicit from Bernadette’s own lips. Now, for the first time, the bold statement was made leaving no doubt with whom Bernadette had met. Stories of the village's “little saint” soon appeared in newspapers all across France. Some journalists made the trek to Lourdes to investigate. They were generally dismissive in their reporting, mostly because Bernadette was such an unlikely candidate for the attentions of The Blessed Mother. Press reports generally focused on Bernadette’s peasant illiteracy. She was uncultured and impertinent [Not that it matters, but she was impertinent by all other disinterested accounts. But then again, what teenage girl isn’t considered impertinent by her elders?]. Her “visions” were dismissed as the workings of hallucinations. She seemed unmoved by these criticisms, mostly because she did not understand them. She saw what she saw. If no one else could see, so be it. Thus, she was grilled extensively and the locals were questioned about her knowledge of the Immaculate Conception dogma. If she had no prior knowledge of the Immaculate Conception dogma, then the peasant girl must have surely obtained that information spectrally. [This is in no way “miraculous” – anyone can pass his or her hand through a flame unharmed. It is the continual application – as the doctor did to her afterward – that causes localized heating, burning, and pain]. The number of curiosity seekers and devout followers of Bernadette had grown out of control. Several thousand people accompanied her on her visits to the grotto. It was a public nuisance and was disruptive for the town. On mayoral orders, the grotto was barricaded on June 8, 1858. Guards were stationed along the barricade. Order had to be restored, and anyone venturing too close to the grotto risked trouble. Those caught kneeling near it were fined. In a truly Orwellian dictate the mayor of Lourdes even outlawed talking about the grotto. This act of free speech was likewise subject to a fine. On this last occasion, Bernadette simply quietly communed with the apparition in prayer. The Emperor Louis Napoleon III overturned the Lourdes mayor’s edict about the grotto, and commanded its reopening to the public in October 1858. Bernadette received no further spectral visions after her visit of July 16, 1858, and she felt no compulsion to return to the grotto again. Unfortunately, although Bernadette was done with her business at the grotto the public was not done with her. She became a religious celebrity, plagued with requests for “laying on” of hands, or for her to simply touch common objects. These items then became religious relics. With all the publicity, more pilgrims arrived daily to meet her. The harassment became too much for the family. Her family successfully harangued Bernadette to the point she elected to move away to a place where she was inaccessible. She moved into the parish convent. She did not speak true French nor could she read or write. She was given private instructions, however, and she learned to read and speak proper French. She also learned to write well. Time passed, but even though she was semi-cloistered at the hospice, curiosity seekers and the beleaguered (and the deranged) continued to badger her, making her life and that of her host nuns difficult. Father Peyramale, originally a vocal opponent, became a champion of hers. In a consult with her now-supportive priest, she was persuaded to hide herself in a quieter convent where perhaps her celebrity would not follow, and she could be left in peace. She was also a sickly and frail young woman. She liked the cloistered Carmelite nuns. Father Peyramale discouraged that choice. Bernadette was somewhat free-spirited; he advised her the rules of this order were too strict for her, and her health far too frail for their ascetic lifestyle. She leaned toward accepting the invitation of the Daughters of Charity of St. Vincent de Paul, but their head-gear (their coronette) was too burdensome for her weak frame. She had to leave but had nowhere desirable to go. The area bishop (from Nevers, over 200 miles away) traveled to Lourdes to help the young woman in her decision. In discussion with the bishop Bernadette claimed she had no skills, and she had nothing of value to offer any congregation. The bishop assured her she could make her way by doing nothing more than helping in the convent kitchen, “grating carrots”. It was with this whimsical bit of coercion the frazzled and physically fragile Bernadette Soubirous decided she would venture far from her little village. This began the dark times for the future saint.